Larco Engineering are an acknowledged leader in the supply, installation, servicing & repair of industrial roller shutters and roller doors throughout Ireland. The roller shutter doors provided by Larco are manufactured using quality materials and precise controls to ensure long service life in normal industrial and domestic applications. 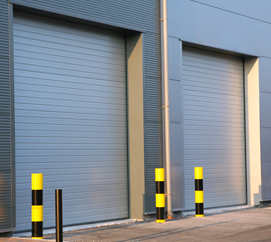 Industrial roller shutter doors offer an effective security solution for all types of industrial premises, from new industrial units to factory extensions or refurbishments. Our manual-hand-operated roller doors are assisted by a spring loaded axle which the door lathes our mounted to, this spring takes part of the weight of the door, when the door is in operation. With a little effort these doors open and close in a smooth movement. Secured with strong locks each side of the door, these doors offer the business owner peace of mind. Electric motor operated roller doors, rise and lower by the push of a button. These doors are powered by reliable tubular motors. Insulated roller doors are manufactured from twin walled corrosion resistant aluminium lathes and insulated with CFC free foam. This type of door provides great heat and soundproofing qualities when used on fully insulated buildings. These electric motor operated insulated roller doors, rise and lower at the push of a button, and offer a quiet, convenient solution to secure your insulated premises. At Larco Engineering the industrial doors we install & repair are always reliable and secure. Our doors are curtain constructed from 75mm wide curved interlocking single skin steel lath or 85mm wide flat interlocking insulated double skin lath with nylon endlocks. Both of these solutions come with a galvanised steel bottom rail. Our roller shutter doors are available in galvanised, painted, plasticol or powder coated finishes. They are also available in a wide range of colours and sizes and come either hand chain or electric operated. Electric operation is by a single or 3 phase supply with a 3 button control panel as standard. Contact Larco Engineering today for a quote on the supply, installation, servicing or repair of roller shutter doors throughout Ireland.